Mrs. J.B. Carmichael (Auntie Van). Photographed by Castor Ltd., Edmonton c. 1919. Image courtesy of the City of Edmonton Archives. The development of Edmonton’s vibrant arts scene is largely due to a number of talented individuals whose contributions to this city are immeasurable. One woman, in particular, played an integral role in the development of classical music in the city. Known to her students and close friends as Auntie Van, Beatrice Carmichael was a classically trained musician from Chicago, who adopted Edmonton as her home and used her immense talents and influence to shape Edmonton’s cultural landscape. Beatrice Carmichael’s numerous musical ventures brought an air of sophistication and artistic polish to the young city. Her legacy resonates strongly today through her cultivation of the arts and the cultural institutions that she spearheaded. 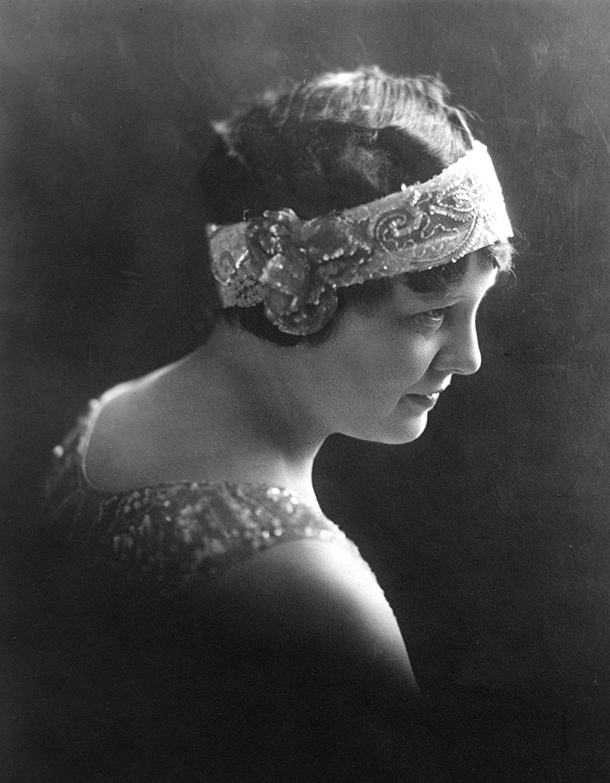 Beatrice van Loon was born in South Bend, Indiana in 1889. Born into a family of five girls, she was given an early introduction to the stage by her musician father. At the age of ten, her family moved to Chicago where she began her formal musical education. It was clear at a young age, that Beatrice had an abundance of musical talent; an accomplished vocalist, violinist and pianist, she was only 16 when she conducted her first operetta. In 1914, Beatrice’s vocal coach arranged for her to further her studies in Germany. However, when her departure was interrupted by the onset of WWI, she remained in Chicago to complete a Bachelor of Music degree. Postcard for Beatrice Van Loon and her Holland Girls Orchestra. Image courtesy of Peggy Donnelly. In the early years of the 20th century, women were commonly excluded from performing with professional orchestras, prompting the emergence of all-women touring ensembles. At the behest of her manager, Beatrice joined such an ensemble. Dressed in traditional Dutch costumes, the 7- piece ensemble was billed as Beatrice Van Loon’s Holland Girls Orchestra, and toured as a novelty act in the style of Vaudeville. In the fall of 1920, the orchestra was offered an 8-week engagement at Edmonton’s MacDonald Hotel. Though initially unaware of Edmonton’s whereabouts, Beatrice accepted the offer and she and her band members boarded a train heading west to the bustling prairie city. The ladies from Chicago were a hit. Performing each night to an appreciative audience, Beatrice showcased multiple talents, playing the violin, singing and conducting the ensemble. One audience member was particularly impressed by Beatrice’s musical charms. Local dentist, Dr. James B. Carmichael, was so beguiled, that the musical engagement ended with a marriage proposal and Beatrice Van Loon remained in Edmonton to become Mrs. J.B Carmichael. Contrary to the cultural norm for women of that era, married life did not mark the end of Beatrice’s career. Immediately directing her energies and talents to her adopted city, she taught voice, violin and piano, an occupation she would sustain throughout her life. Becoming a valued member of the Edmonton Symphony, she played 1st violin for 13 seasons until it disbanded in 1932. She also had the honor of conducting its final concert, earning the distinction of being the first woman in Canada to conduct an orchestra. Beatrice was heavily involved with the development of musical organizations at the University of Alberta. Organizing and conducting the University of Alberta Orchestra in 1923, she was also responsible for the formation of its smaller offshoot, the CKUA Radio Orchestra in 1927. Under her direction, the University Orchestra collaborated with the University Glee Club in the performance of light operas leading to the formation of the University Philharmonic Society in 1932. After a decade of instructing and inspiring a generation of young musicians, she left the university to pursue other projects. Beatrice Carmichael, front row, 4th from left. University of Alberta University Radio Orchestra, 1926-1927. Image courtesy of Provincial Archives of Alberta A3535. Beatrice was an enthusiastic supporter of the Edmonton Women’s Musical Club. In 1932, she was asked to organize a concert performance of Gounod’s Faust. Its success planted the seed for Beatrice’s grandest undertaking, the establishment of a local opera company. In January of 1935, in the midst of the Depression, Beatrice invited a group of friends to her home to discuss the formation of an opera company and the Edmonton Civic Opera Society was born. The Edmonton Civic Opera debuted in April 1935, with the production of Maritana. It was an ambitious undertaking with 12 principal cast members, 38 chorus members and a 30-piece orchestra. Although touted by reviewers for its lavish sets and decadent costumes, the debut was not without its mishaps and ended its run with a financial loss. Beatrice, however, was undaunted by the shaky start and used her own money to cover outstanding expenses. Backed by her talent and strong leadership, the opera excelled with each successive production. Following the first year, the opera persistently operated in the black. Surpluses were funneled into a scholarship program for young musicians providing study opportunities in cities such as Chicago and New York. Establishing an opera company during the height of the Depression was a gamble, especially since the harsh economic realities contributed to the loss of other cultural organizations like the Edmonton Symphony. Following the Depression, WWII also brought challenges. Sets were affected by a shortage of materials and the chorus and orchestra were reduced in size due to the number of cast members that enlisted. Sadly, three of the men did not return. The opera’s ability to flourish in the midst of such challenges speaks to its popularity and the quality of entertainment it provided. Over the years, critical reviews consistently described her brilliance, tirelessness and memorable performances. Edmonton’s post-war climate saw the emergence of rival operatic companies and other competing cultural activities. The Edmonton Civic Opera Society, however, still remained a much-loved favorite. In 1957, the Civic Opera was invited to stage Carmen during the opening week of the Jubilee Auditorium, a testament to the opera’s favorable standing within the community. Cast of ‘Rose Marie’ featuring Beatrice Carmichael and Irv Matthew. Image courtesy of the City of Edmonton Archives EA-409-287. After 28 years, the musical director and driving force behind the Edmonton Civic Opera Society, retired due to failing health. On March 11, 1964, Beatrice Carmichael passed away in her home at the age of 75. The headline of the Edmonton Journal read, “The Grand Dame of Edmonton Opera is dead”. In the passing of Beatrice Carmichael, Edmonton lost a musical dynamo and one of its most prolific cultural contributors. As the city came of age, Beatrice helped to lay a foundation for the arts community, devoting a lifetime to its growth and development. It was fortunate circumstance that brought the talented young woman from Chicago and her legacy lives in the high caliber of arts and culture that Edmonton is renowned for today. Peggy Donnelly has a Masters in Archaeology and Heritage. She has worked as an archaeologist in Alberta, British Columbia and the USA. She has a strong interest in western Canadian history in particular the rich history of the Edmonton area.